I’m a seasons girl. I embrace and appreciate each season for the unique foods and rituals it brings. Now, I’d be lying if I said I didn’t have my favorites. Fall will always hold a special place in my heart – the sweaters, apple cider and crisp leaves get me every time. And while summer is admittedly my least favorite season, as each year passes, I am able to find a new reason to appreciate the warm weather and long days. It’s this time of year that the windows get opened, allowing warm flowery winds to blow through the house. Waking up to sunshine, instead of the still visible moon is always a delightful thing, too. Summer also heralds in iced tea, picnics and seafood. Why is it that seafood always calls to me when the weather warms up? Is it the fact that it’s light? Is it that seafood is from the water and therefore reminds me of the beach? Maybe it’s both of these things. Maybe I’m just over the heavy meats and dishes of winter. So come spring and summer, I’m craving fish and shrimp. Is that just me? Plus, I often call them shrimpies. In the privacy of my own home, of course. After making my Tropical Quinoa with Roasted Shrimp several times I knew I loved the combination of shrimp and quinoa, but I wanted to mix up the combination a little bit. Try a different flavor profile and cooking method. I turned to my trusty parchment cooking that I shared with my Ginger Mango Chicken en Papillote. I love the idea of individual packets and how every element of the dinner can cook together. It’s like a lovely present that you open right at the table, wafting scents of citrus and herbs around. 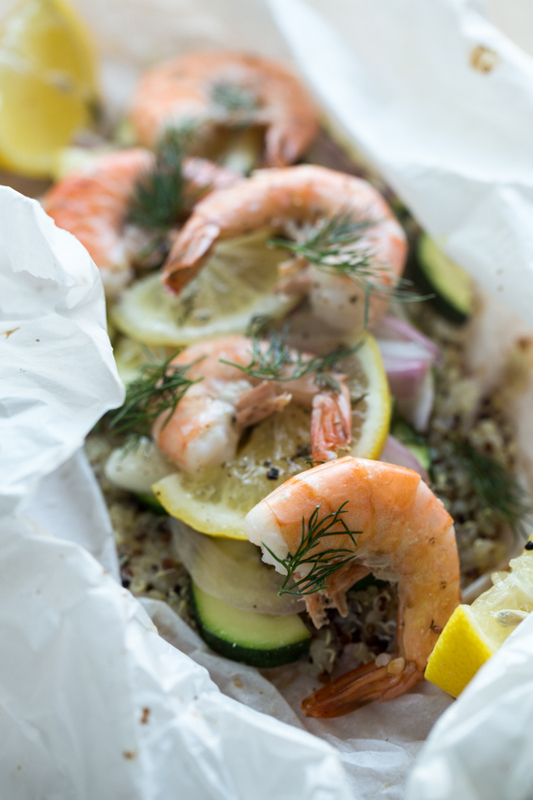 For this Shrimp and Rainbow Quinoa en Papillote, I used lemon, dill and shallots along with the shrimp, zucchini and quinoa. For this dish, I opted for the same stunning rainbow quinoa that I used for my Chocolate Coconut Quinoa Granola. It’s a blend of red, black and golden quinoa that adds nuttiness and depth of flavor to this light and lovely dish. 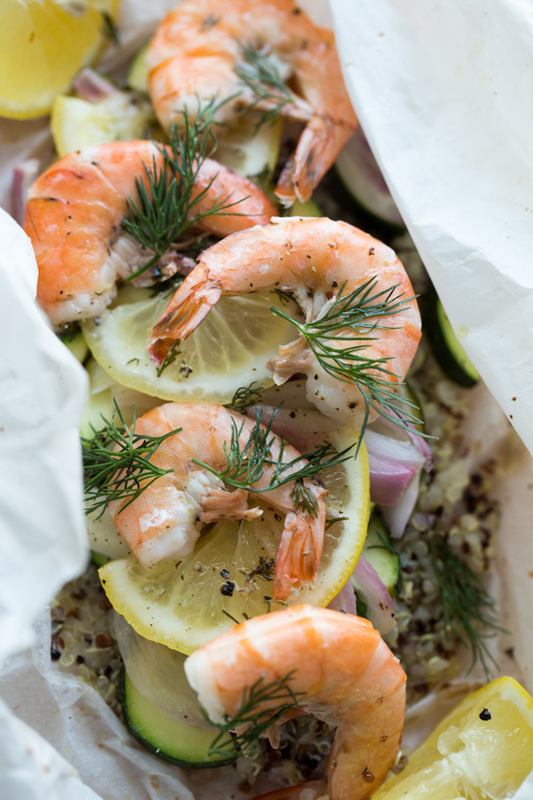 This Shrimp and Rainbow Quinoa en Papillote is simple to put together, but complex in it’s flavors. 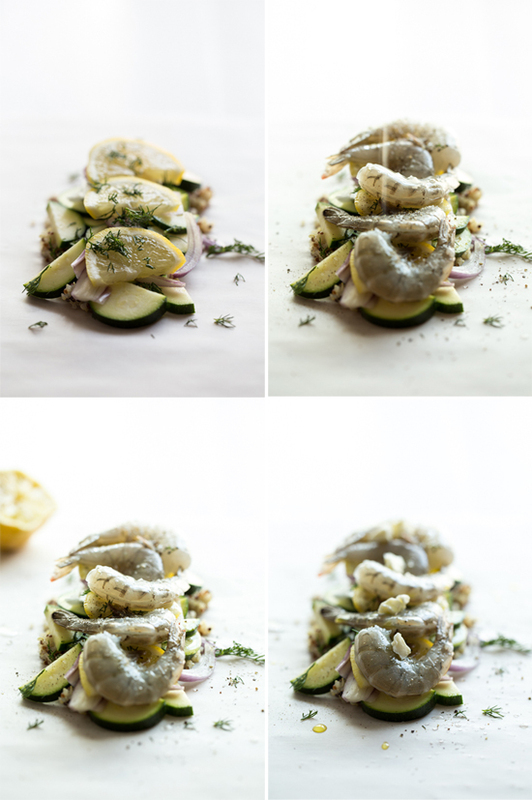 The lemon and dill are incredibly aromatic, and the olive oil and butter blend together to create a luscious sauce that flavors the entire dish perfectly. Topped with juicy and tender shrimp, this meal is a show stopper. So, throw open your windows, pour yourself a glass of lemony iced tea and pop some Shrimp and Rainbow Quinoa packets in the oven tonight. You’re bound to have an awesome night – and you totally deserve it! Preheat oven to 350 degrees. Cut 4 pieces of parchment paper about 15 inches X 18 inches. Have all ingredients laid out so that building your packets goes smoothly. 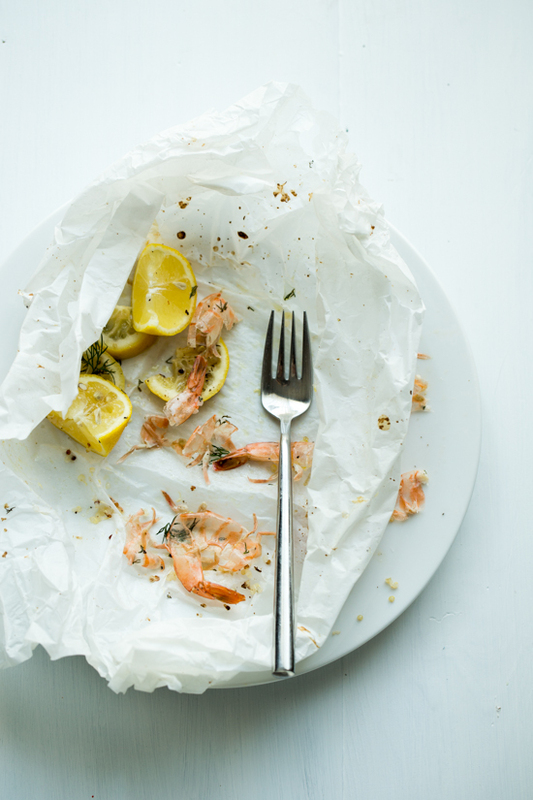 Build your packets: -Spread 1/4 cup of quinoa on top of one sheet of parchment paper. -Layer 1/4 of the zucchini slices, 1/4 of the sliced shallots, 6 shrimp and 1/4 of the lemon slices on top of the quinoa. -Drizzle ingredients with 1/4 of the lemon juice, 1 teaspoon of olive oil, and dot with 1/4 tablespoon of butter. -Sprinkle with chopped dill, salt and pepper. Pull up sides of parchment and meet edges together. Fold edges down to close the top. Twist ends or fold them under to create a sealed packet. Place packet on rimmed baking sheet. Repeat steps with the remaining parchment sheets and ingredients. 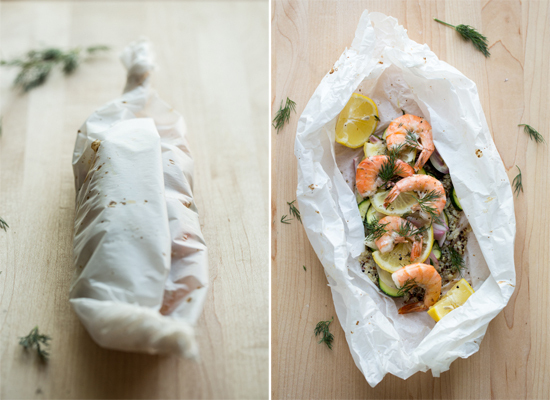 Bake packets for 20-25 minutes or until shrimp is cooked through. To serve, place packets on dinner plates and open at the table for a dramatic and aromatic reveal. Enjoy! The nice thing about this, is you can totally adjust the quantities for one. In fact, you could even switch your husbands up and add chicken instead! I’m getting a bit obsessive about these parchment packets. They’re just too cute! Thanks for stopping by, Alaina!! 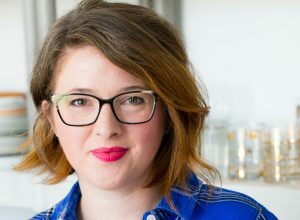 I’m a seasons gal, too… I love when various seasonal fruits and veggies are available at the beginning of each season and love the traditions or habits associated with each one, too. 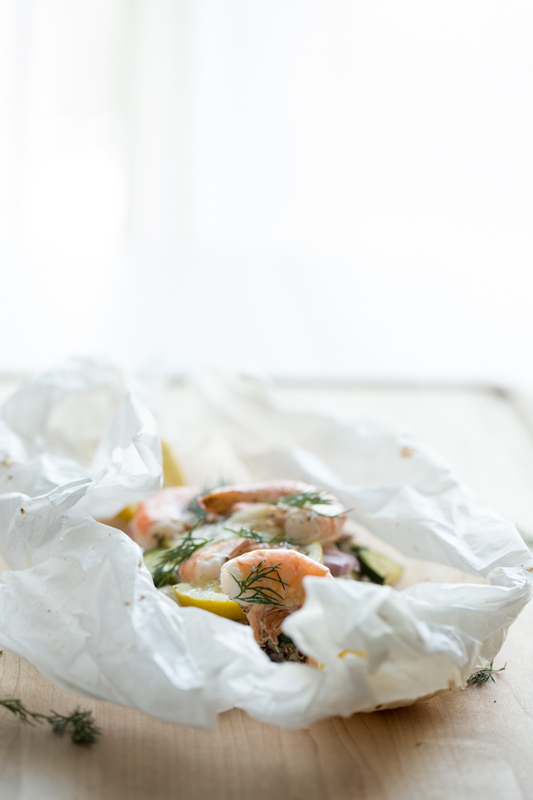 Your shrimp in papillote looks phenomenal – the perfect meal! I’ve never tried this technique before and am excited to give it a go! You’ll love this technique! It is so versatile! If you are wanting to know more about it, there was an awesome episode of Good Eats with Alton Brown where he talks all about the building and layering of flavors and textures in a packet. Very cool! Have a great weekend!